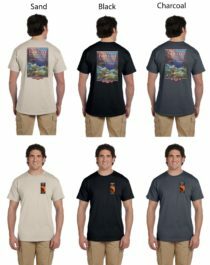 Celebrate the Sesquicentennial of the epic John Wesley Powell 1969 Expedition with this collectors item t-shirt. The front of the t-shirt has the Powell Sesquicentennial logo on the upper left. The back image is the Glen Hopkinson painting, Into the Unknown. The t-shirts are 6.0 oz pre-shrunk 100% Ultra® cotton. (Imported), double-needle stiched neckline, bottom hem and sleeves, Quarter-turned with tapered neck and shoulders. Also available as a flat wall map suitable for framing. A must have for old and new fans! 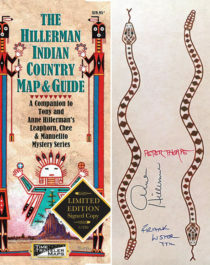 Time Traveler Maps announces a new edition of the popular Hillerman Indian Country Map & Guide. 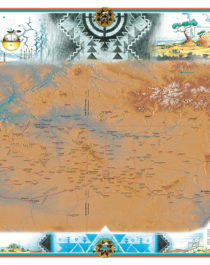 This companion map features a 36”x 28” illustrated map highlighting the works of both Tony and Anne Hillerman. 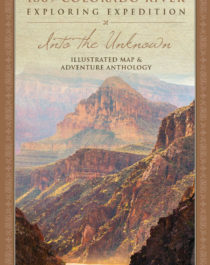 Over 80 plot locations and descriptions from 20 different Chee, Leaphorn, and Manuelito mysteries allow the reader to follow each mystery as they unfold. 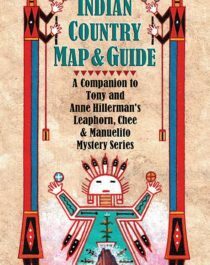 This illustrated map and guide allows the reader to follow the Hillerman crime fighters in their various mysteries set in the heart of Indian Country in the American Southwest. Each plot location is numbered with a book icon. Peter Thorpe, the designer of the jackets of the popular book series, illustrates this unique piece with original graphic art and his distinctive book icons. Flat map 24” X 36”, folded to 4 7/8” X 9”, Hard cover, with ¼” spine.